Some of the larger gains were driven by high inflation in each respective currency, but gold also advanced in currencies that were relatively stable during 2015. The biggest decline for gold came in U.S. dollars and Swiss francs, both down 11%. The next biggest loss was in Japanese yen, down 10% for the year. The bottom line is that while most people price gold in dollars and therefore have a gloomy assessment of gold’s performance during 2015, it actually performed fairly well globally. It has been an effective inflation hedge in many of the countries where their currencies weakened during the year. With gold’s biggest decline coming in U.S. dollars, this could be an excellent opportunity to buy gold with dollars during 2016. After a strong start to the year in 2015, the dollar effectively topped out and traded sideways for most of the year. 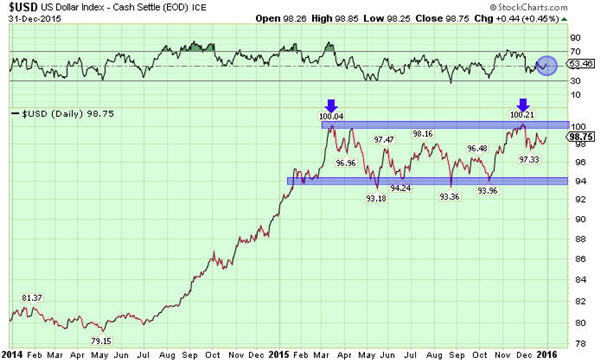 The USD put in a double top during late November around the 100 level, the same resistance it faced in March. There are some bullish factors that could propel the dollar higher in 2016. Rising interest rates should be bullish for the USD and if the stock market drops sharply as we anticipate, investors are likely to turn to dollars as a safe haven in the short term. But one could argue that the dollar is currently overbought and the factors mentioned above have already been priced into the USD index. Eventually, I think people are going to realize that the dollar is not the safe haven that they believe it to be. There is an accelerating trend of de-dollarization around the globe, as a growing number of nations have opted to drop the dollar and use local currencies in trade. BRICS nations in particular are leading this charge and creating their own economic unions, collective banks and trade agreements to bypass the dollar. Some believe that the dollar is the best of the fiat currencies, backed up by U.S. military might and willingness to enforce the petrodollar. But the U.S. is being challenged in the Middle East by an emergent Russia that will no longer allow the United States to dictate policy and dominate the energy trade. And while the official debt-to-GDP ratio in the United States looks better than other nations, it does not factor in unfunded liabilities or the off-sheet derivatives time bomb that continues to tick. Eventually, I believe that investors around the globe will lose faith in the U.S. dollar and instead turn to precious metals or even Bitcoin as a preferred store of wealth during turbulent times. While I can’t predict exactly when this will happen, I see this outcome as inevitable and a question of when, not if it will occur. In the meantime, I think the currently depressed prices for precious metals offer long-term investors an excellent opportunity to buy in tranches and continue stacking. Rising investment demand during 2015 suggests this is exactly what is occurring. 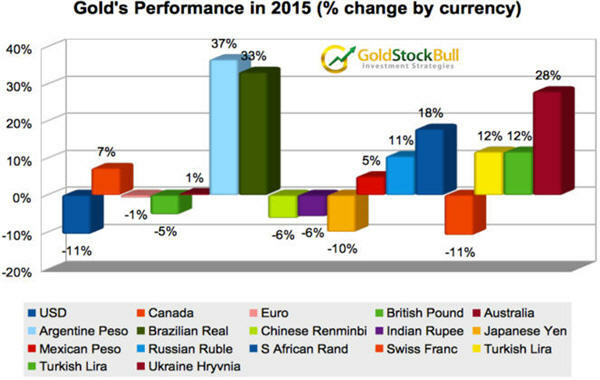 The gold chart for 2015 is undeniably bearish. 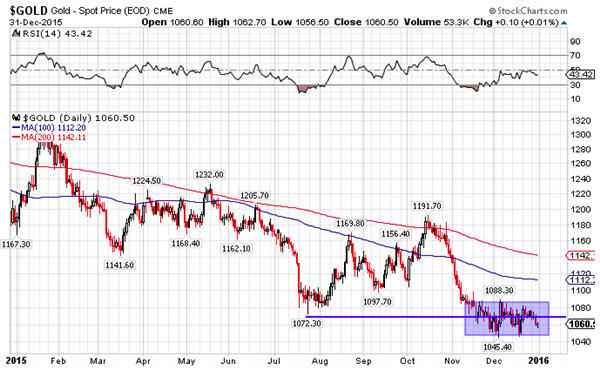 The failure of support at $1,072 was significant and suggests more downside ahead. That being said, the price appears to be carving out a bottoming pattern and has bounced back above $1,072 several times since the support was initially breached. This gives some bullish color to our outlook on gold, especially if the price can climb back above $1,100 in the near term. Get our insider trade alerts, monthly newsletter and model portfolio by becoming a Gold Stock Bull premium member. Jason Hamlin is the founder of Gold Stock Bull and has been investing in precious metals for over 20 years. Jason spent nearly a decade in analytics for the world’s largest market research firm, before finding success investing full time. He launched Gold Stock Bull in 2005 and turned his focus from helping fortune 500 companies to helping individual investors that were struggling to achieve strong gains in the stock market.